COCOLI, Panama (Reuters) - As it enters the final stretch of a massive expansion, the Panama Canal Authority is setting its sights on an even more ambitious project worth up to $17 billion that would allow it to handle the world's biggest ships. Workers are now installing giant, 22-story lock gates to accommodate larger "Post-Panamax" ships through the Canal, one of the world's busiest maritime routes. The project involves building a third set of locks on the Canal. It is being headed by Italy's Salini Impregilo and Spain's Sacyr, and should open on April 1, 2016. But Jorge Quijano, who leads the Panama Canal Authority, is already looking beyond this project to a fourth set of locks which would serve a new generation of even bigger ships that can carry 20,000 containers. "Looking at our geology and the experience we gained with this current expansion, we estimate it's a project that could cost between $16 billion and $17 billion," he told Reuters, adding it would allow Panama to compete head-to-head with Egypt's Suez Canal. The Panama Canal Authority has long talked about building a fourth set of locks but Quijano said it is now for the first time seriously studying the project. He says container ship traffic through the Canal has risen around 3 to 4 percent in the last few months due to a backlog at U.S. West Coast ports, which were hit by a now-settled labor dispute disrupting trans-Pacific trade..
"It has had a positive impact for us, but the Suez Canal has been the big winner because they can handle the Post-Panamax ships," Quijano said. If the Canal goes ahead with the project, Quijano says it could be completed within 15 years and that financing options include issuing bonds and using the Canal's own revenues. China Harbour Engineering Company Ltd (CHEC), a subsidiary of state-owned China Communications Construction Co Ltd, has voiced interest in building and financing a fourth set of locks in Panama, and Quijano said company officials met with him this week. Further north in Nicaragua, a little-known Chinese businessman has vowed to build a $50 billion canal across the country to rival Panama's, although some industry experts are deeply skeptical, pointing to the high costs, environmental challenges and the firm's lack of experience in such projects. 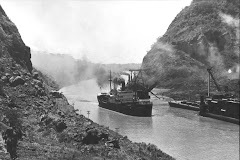 The Panama Canal's current expansion plan was originally set at $5.25 billion but the costs rose and the administrator became locked in a dispute with building consortium Grupo Unidos Por el Canal (GUPC), which built the third set of locks. Quijano said GUPC has submitted claims totaling $2.3 billion to date. Giuseppe Quarta, GUPC's CEO, says he is unsure whether its members would be interested in bidding to build a fourth set of locks, saying the Canal Authority has repeatedly rejected its claims in the dispute. Quijano says the Canal has already lost around $400 million in revenue because of project delays caused by the spat. The giant new locks sit alongside those of the existing Panama Canal and include a complex reservoir system that will empty and fill the lock chambers using gravity rather than pumps. Sections of the 100-year-old waterway are being dredged to take ships with a greater draft. Any new project to build a fourth set of locks will live or die by trade flows, says Maersk Line, a unit of conglomerate A.P. Moller-Maersk. It is a major customer of the Panama Canal, crossing it 300 to 350 times a year. "The big question for any future expansion of the Panama Canal is will trade growth sustain that extra investment," said Robbert Jan van Trooijen, Maersk Line's CEO for Latin America and the Caribbean. "For me, to see any of those (mega) ships coming near Latin America, that's the very distant future." Nicaraguans have lots of questions, but the closed-door nature of canal decisions mean they're getting few answers – and taking their frustration to the streets. On the windy shore of Lake Nicaragua, farmer Dayton Guzman surveys the vast expanse of water his family relies on for irrigation. The lake’s future is in doubt since a massive Chinese-backed canal project was inaugurated late last year. The multibillion-dollar “Grand Canal” is slated to stretch 170 miles from the Caribbean to the Pacific, and some 60 miles of it will cross through this lake. Recommended: Think you know Latin America? Take our geography quiz. The government argues the project will create tens of thousands of jobs and boost GDP by up to 12 percent – a critical point in a country where nearly three-quarters of the population lives on less than $4 a day. But the canal has encountered both careful criticism and fierce opposition from Nicaraguans. And the lake has become a potent symbol of what’s at stake. The 3,000 square mile lake is Central America’s largest; home to endangered species and a water source for hundreds of thousands of people. Scientists warn the dredging required for the canal would result in irrevocable damage. Concerns about land expropriation and pollution are spreading, with tens of thousands of demonstrators marching in more than 35 protests to date. The Nicaraguan Conference of Bishops has called on the government ofPresident Daniel Ortega for open debate and increased transparency, saying it’s “worried” about the project. President Ortega has been the target of protests before, but this time may be different. In recent years, public criticism has followed party lines. But as pressure mounts on the government to respond to concerns about the environmental and economic risks of building the canal, today’s calls for debate present a new challenge to Ortega’s power. The protests now include “many who are sympathetic to the government,” says Manuel Ortega Hegg, a Nicaraguan sociologist. “What’s new is they involve a wider range of groups, like campesinos,” traditionally a Sandinista party base, courted during elections with gifts of tin roofs and livestock. Dissent goes “beyond political parties,” he says. As the afternoon sun turns amber on the island of Ometepe, a white egret stalks in the lake shallows and a woman washes clothes on a broad detergent-stained rock. A mother and her son fish from the shore, throwing in their lines again and again as the sun sets. Home to two volcanoes in the middle of the lake, Ometepe is expected to be heavily impacted if the canal project moves forward. The canal would pass within three miles of its black sand beaches. The island is also the site of a planned resort, one of several “subprojects" of the canal, including two deepwater ports and a free-trade zone. Some doubt the ambitious canal plan will go through. No significant construction has happened, though the government has started widening an access road on the Pacific coast. “They said they wanted the farm for a five-star hotel,” Mr. Guzman adds. The Guzmans say they won’t sell. “We have our life here, where would we go?” he asks, adding that his 12 employees would also be without work if the land were expropriated. In 2013, Nicaragua passed a law that granted the canal concession after just three hours of debate. The hundred-year concession to Hong Kong firm HKND allows the company to claim any property it needs, even outside the canal zone. The firm is headed by billionaire Wang Jing, a telecommunications magnate. Some Ometepe residents complain the government hasn’t given them any information. “If the canal is going to hurt us fishermen, we need to know how it will affect us,” says Santos Lopes, who’s been fishing on the lake for 30 years. He says he would give up his nets to earn a wage working on the canal. But he doesn’t know if that tradeoff is even possible. Given the lack of debate on the part of the government, civil society groups have stepped in. In November Jorge Huete-Pérez, a biologist and vice president of the Academy of Sciences of Nicaragua, hosted a conference about the canal, inviting dozens of international scientists. The government and HKND’s environmental consultants declined invitations, but the gathering offered an opportunity for scientists to voice their concerns. “We know they’re going to damage the lake, because there’s no technology they can use that’s not going to be invasive and create damage,” Mr. Huete-Pérez says. But some say Nicaragua’s democracy is an illusion. As president during the Sandinista revolution in the 1980s, Ortega supported leftist policies such as land reform and nationalizing industries. On his return to power in 2006, he promised to help the poor and ensure access to free education and health care. He was re-elected to a third term in 2011, after a widely criticized constitutional change that allowed him to stay in office. Critics say Ortega has traded his political vision for the consolidation of power: In 2006, he formed a strategic alliance with the conservative Catholic Church. Since then, his government has consolidated independent media into state-controlled channels, enforced party loyalty by state employees, and restricted access to information, all seen as signs of growing authoritarianism. Civil society groups say their voices are suppressed, and legal efforts to modify the canal law have been blocked. The Conference also warned that communities on the canal route are determined in their opposition, which could lead to “armed conflict” if the government doesn’t address dissent in an open, democratic manner. Ometepe has been the site of several recent protests. In January, residents of one community met a government medical brigade with a bonfire and a banner reading, “Traitor Ortega, no more lies.” Activists here and elsewhere on the canal route claim that the real mission of the brigade and other visits like it aren’t medical. “You give them your identification number, your name, and once you’ve done that, you read a document that says you’re in favor of the canal,” says activist Jairo Carrion. Although these demonstrations ended peacefully, dozens of protesters were arrested and foreign journalists were harassed while reporting from the canal zone in December. There’s more subtle suppression of speech, too. Maria, a secondary school teacher on Ometepe, says teachers were required to attend a canal presentation by a Sandinista representative. They were told to teach their students that the canal has “no negative environmental impacts, and would create jobs,” she says. While many teachers are critical of the project, Maria fears losing her job if she speaks out. She asked that only her first name be used in this article. If you’re a state employee, she says, “you have to be in agreement” with the party. The government is pushing forward with its plan, opening canal commission offices in communities slated for expropriation. Meanwhile protests continue, with a national march scheduled in the capital, Managua, next month. In late December, Nicaragua inaugurated work on what it says will be a waterway able to handle the world’s largest ships passing between the Atlantic and the Pacific. The project comes as Panama doubles its own canal's capacity. PANAMA CITY — When it comes to interoceanic canals, Panamanians speak with a century of experience. So as nearby Nicaragua moves ahead with a plan to build what it claims would be a bigger, better canal, some Panamanians look on with interest and puzzlement. “We take the possibility of construction of a canal in Nicaragua very seriously,” said Francisco J. Miguez, executive vice president for finance and administration of the Panama Canal Authority, the waterway’s operator. The Nicaraguan plan is feasible, Miguez said. “We find that, technically, the project can be built ... with enough resources and time,” he said. Miguez spoke in a measured voice in his office at the imposing headquarters of the Panama Canal, set on a commanding hill. He didn’t display undue concern that a clash of rival canals on the Central American isthmus might be in the offing, one that would have an impact on US consumers and businesses reliant on global trade. TEST YOUR KNOWLEDGEThink you know Latin America? Take our geography quiz. In late December, Nicaraguan President Daniel Ortega and Chinese telecom entrepreneur Wang Jing formally inaugurated work on what they said would be a 173-mile-long waterway capable of handling the world’s largest ships as they pass between the Atlantic and Pacific oceans. Mystery surrounds the Nicaraguan project, especially how Wang plans to finance a canal that’s expected to cost $50 billion, and perhaps more. Many Western experts suggest China’s government may eventually emerge as the project’s patron. Nicaraguan lawmakers in 2013 granted Wang’s Hong Kong-based HKND Group a 50-year concession to build a canal in return for a payment of $10 million a year once it’s operational. The group was also given a green light to develop ports, an airport, roads, and a railway even if the canal doesn’t get built. The Nicaragua project comes as Panama is doubling its canal’s capacity, adding a third set of locks to accommodate ships more than twice as big as in the past. The $5.25 billion expansion is 85 percent complete and expected to be operational early next year. Outside maritime experts say Panama has reason to be concerned about an eventual rival canal in Nicaragua. But Miguez said Panama Canal experts suspected Nicaragua was mistaken in thinking it would draw supertankers and container ships that were larger than those that would fit through the expanded Panama Canal. “Our preliminary assessment is that there is not [a market]. You don’t see trends right away going to bigger than 14,000-container vessels. There’s no trend moving in that direction,” Miguez said. Panama Canal Administrator Jorge L. Quijano said in mid-2014 that the expansion would allow the passage of 98 percent of the current world fleet of ships. Basically, the two countries are wagering on whether cargo ships will grow ever larger and trade routes will adjust as ports invest in deeper channels and bigger gantry cranes to handle the super ships. Since the 50-mile-long Panama Canal began operating in 1914, the largest ships that could fit through the locks were called Panamax vessels, equipped to carry about 5,000 20-foot containers. After the expansion, the largest ships that will fit, which are known as post-Panamax and are the length of aircraft carriers, can haul 13,000 to 14,000 such containers. Miguez said the post-Panamax vessel’s size hit the current sweet spot. “It’s a vessel that provides very good economies of scale. It’s an efficient vessel. And it’s also a flexible vessel. That means it can be loaded and unloaded within reasonable times in ports,” he said. “When you get to really, really big vessels ... it’s a matter of, can you fill them? Because when business is booming, when the economies are growing, it’s easier to fill a 14,000 (container) vessel or more,” Miguez said. “But when you have, you know, economies that are not doing well, then sometimes those vessels become less flexible, less profitable, if you cannot fill them quickly to keep services day in, day out,” he said. A project description released last month by the HKND Group said the Nicaraguan canal would handle gargantuan future ships hauling up to 25,000 20-foot containers or monster bulk carriers the length of 12 football fields. A US shipping expert questioned whether such large ships would find profitable routes moving through a potential Nicaraguan canal. “I don’t think you’ll ever see grain moving in that size ship,” said James R. Brennan, a partner at Norbridge, a Concord, Mass.-based consultancy for shipping companies and ports. But factors such as financial feasibility may take a backseat to overarching goals for industrial development and global standing, if it turns out the Chinese government is behind the Nicaraguan canal, Brennan said. “I think it’s very, very difficult to bet against the Chinese government if they want to do something,” Brennan said. The US government has been largely silent on the project, and Miguez said that was likely because a second trade route wouldn’t hurt US commercial interests. “Remember, about 60 percent or more of goods that move through the Panama Canal either come or go to the United States. So if the United States has a second route available for them, it means they have redundancy and more reliability,” Miguez said. If shipping trends head toward larger ships, Miguez said, Panama would be ready to build a fourth lane on its canal that would accommodate them. “If the demand exists, we will go to a fourth set of locks,” he said. What'd we miss? Tell us what angles to cover next. We provide insight into global developments. The idea of a canal across Nicaragua, easing transit flows between the Pacific and the Atlantic, is as old as the country itself. But despite numerous surveys and plans across the centuries, no Nicaraguan canal has ever been shown to be economically viable for the investors. The United States, European and numerous Asian countries and companies have explored both “wet” and “dry” canals — the latter utilize rail between ports on both sides of the isthmus. Lately a Chinese businessman has been exploring the idea. His efforts have raised similar questions to previous attempts: Is a canal in Nicaragua economically sound, environmentally responsible or even necessary, particularly given the near completion of the widening of the Panama Canal? The answers are mixed and often depend who is doing the assessment and from what perspective. The man behind the attempt, Wang Jing, may no longer be sure of the answers himself. Questions aside, the Nicaraguan government has approved the plans and is promoting the construction and affiliated investment. As the man at the forefront of the operation, Wang is preparing not only to have the canal dug (and managed) but also to build the affiliated infrastructure — port expansion and telecommunications projects as well as tourism and real estate deals along the canal route. Money is already flowing, environmental studies are underway, Western public relations and accounting firms have been hired, and early assessments and visits are being made to determine the cost and difficulty of buying up land along the route, often meeting opposition from locals. All the while, the cost estimates for the canal construction continue to rise; they are currently at upward of $50 billion and by some estimates are likely to reach $100 billion. Money spent upfront on surveys and even early moves to purchase land do not mean the canal will be completed, just as the economic and environmental obstacles do not necessarily mean the canal will stall out before completion. The world is littered with hero projects that, in retrospect, perhaps would have been better left unbuilt or at least proved more costly for their investors than anticipated. But the construction and plans have raised numerous questions about who is really behind the canal project. Wang Jing, chairman and CEO of the Hong Kong Nicaraguan Canal Development Group (HKND), which has the contract to build, develop and manage the Nicaraguan canal, is one of China’s richest men, worth some $6.6 billion according to Forbes. He has been involved in telecommunications and mineral operations, though by most accounts he owes his fortune more to good luck and timing than through connections with Beijing.